The new TST-902 Advanced Wireless Touch Screen delivers all of the beauty and dedicated control of industry-leading TSW touch screens in a wireless tablet. You get wireless control, voice command recognition, and web browsing all in a thin and stylish design. Even better, primary touch screen functionality is supported via Crestron ER wireless communications, lessening or eliminating the need for Wi-Fi®. The TST-902 features high-resolution graphics and vibrant colors that bring exclusive Crestron Smart Graphics™ to life. The ultra-bright widescreen display, capacitive touch screen, H.264 streaming video, and edge-to-edge glass deliver a striking interactive experience. 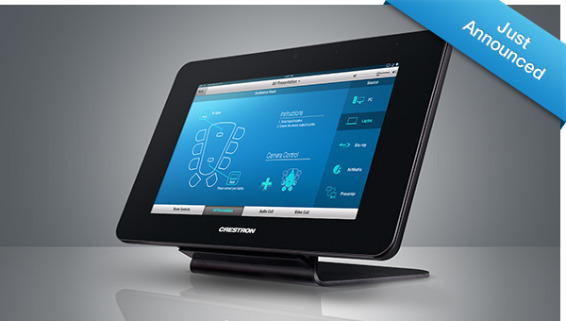 The TST-902 provides the high-performance control expected from Crestron, with the elegant design elements found in the latest tablets. Smart Graphics enables gesture navigation, swiping, and kinetic effects such as knobs, sliders, gauges, and scrolling lists common in smartphones and tablets. In addition to its touch screen display, the TST-902 features four rear-mounted pushbuttons for quick access to volume adjustment, channel selection, mouse click, and other programmable functions. The buttons are optimally positioned for easy fingertip access while holding the unit with two hands. The TST-902 also provides the ability to use voice commands to control virtually anything. Now, you can press a button on the touch screen and then speak commands like “Turn off projector” or “Start presentation.” Or, you can speak voice commands to choose a lighting scene, enter a password, and perform many other functions. The TST-902’s high-performance streaming video capability makes it possible to view security cameras and other video sources right on the touch screen. Native support for H.264 and MJPEG formats allows the TST-902 to display live streaming video from an IP camera, a streaming server, or a DigitalMedia™ switcher.